Traumatic brain injury (TBI) is a leading cause of death and disability for both children and adults in the United States. According to the Centers for Disease Control and Prevention (CDC), car crashes account for 14 percent of all TBI cases and 26 percent of all TBI-related deaths. A TBI can occur whenever a person sustains an injury that disrupts the brain's normal function. A concussion is the mildest form of a TBI, but severe cases involving blood clots, lacerations, and nerve damage can result in prolonged loss of consciousness or even death. A TBI can be classified as either open or closed. An open TBI occurs when an object physically goes through the skull and enters the brain. A closed TBI, is the form most commonly associated with car crashes, which generally occurs when the victim sustains a bump, blow, or jolt to the head. Most car accident TBIs happen when the victim’s head hits the steering wheel, windshield, or dashboard. However, TBIs can also occur from the sharp whipping back and forth of the head, without the victim striking his or her head in the accident. Higher speed accidents are the most likely to result in a TBI, but even a low-speed collision can cause mild brain trauma. Children are particularly vulnerable to a TBI at any speed because their brains are still developing. The symptoms of a TBI are varied and may not appear immediately after a car accident. In milder cases, the victim may appear fine until several days later. Physical discomfort: Complaints of dizziness, nausea, headaches, vomiting, or trouble with coordination suggests the presence of a TBI following an auto accident. Sensory deficits: Someone who has suffered a TBI may be more or less sensitive to touch, taste, and other sensations. They could also experience altered sensations. Changes in mood or behavior: Sudden onset depression, anxiety, and irritability are all associated with a TBI. Difficulty communicating: Someone with a TBI may experience trouble understanding speech or talking to others. He or she may also struggle with reading and writing. Intellectual deficits: Problem solving and reasoning abilities can decline as the result of a TBI. Keep in mind that a victim doesn't need to exhibit all these symptoms to be suffering from a TBI and many of these symptoms could also indicate other types of medical problems. After an auto accident, any unusual symptoms should be evaluated by a doctor as a precautionary measure. The majority of TBI patients receive an initial diagnosis from an emergency room doctor, neurologist, or neuropsychologist. 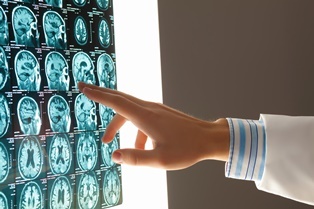 Brain injuries can be diagnosed by assessing the patient's symptoms and ordering diagnostic tests such as computer assisted tomography (CAT) scans, magnetic resonance imaging (MRIs), and X-rays. A concussion or mild TBI will typically heal on its own with time and rest. The effects of a moderate TBI can be treated with a combination of physical, speech, and occupational therapy. The patient's treatment team will work together to develop a plan that addresses the specific symptoms of the brain injury and increases the patient's ability to perform the tasks of daily living. Social workers and case managers may also be called upon to coordinate community-based services that can help the patient return home and increase the patient’s functional capability. A catastrophic brain injury could result in permanent impairment, including paralysis, blindness, hearing loss, memory loss, and steep declines in cognitive function. Someone who has suffered a catastrophic brain injury may no longer be able to live independently and may require around the clock nursing care. If you've been injured in a car accident caused by another driver's negligence, you're entitled to compensation for medical expenses, lost wages, and pain and suffering. Under the correct circumstances, settlements involving a serious TBI can be substantial. Proper compensation is designed to help provide money for the victim’s extensive medical care, the loss of earning capacity, loss of wages or earnings, assistance with daily living, the inability to engage in normal activities, the disruption in relationships with friends and family and other damages and losses suffered by the victim. Working with an experienced personal injury attorney can help ensure that you receive a settlement that adequately compensates you for your injuries. A truly capable personal injury lawyer will know when to settle your case or take it to trial. Personal injury attorneys work on a contingency basis, so there is no upfront cost for legal representation. The legal team at Inland Empire Law Group is committed to helping California residents negotiate fair and prompt personal injury settlements, or when necessary, present the case to a judge or jury. Please call today to schedule a free, no-obligation case review at our Victorville or Rancho Cucamonga locations. Do I Need to Hire a Lawyer to Handle My Car Accident Claim?